The records, reports and testimonies of past volcanic eruptions and their consequences contain a wealth of information from which we can learn valuable lessons. This, in a nutshell, is the starting point of one strand of the STREVA project, ‘Strengthening Resilience in Volcanic Areas‘, which is a large programme funded by two British funding agencies (NERC and ESRC) and directed from the University of East Anglia by Jenni Barclay. This week, researchers from the STREVA team met in a workshop on St Vincent, a luxuriantly vegetated volcanic island in the southern Caribbean, to see what can be learned from the past history of this volcano and how this learning can be used mitigate the risks of future volcanic activity. Spectacular view across the crater of the Soufrière St Vincent, showing the lava dome that erupted in the centre of the crater in 1979-1980, and signs of recent land-sliding. The crater walls have been gradually enlarged and re-cut by successive eruptions, and their internal layers reveal the past volcanic history of the Soufrière. Photo by Paul Cole, University of Plymouth, January 2014. 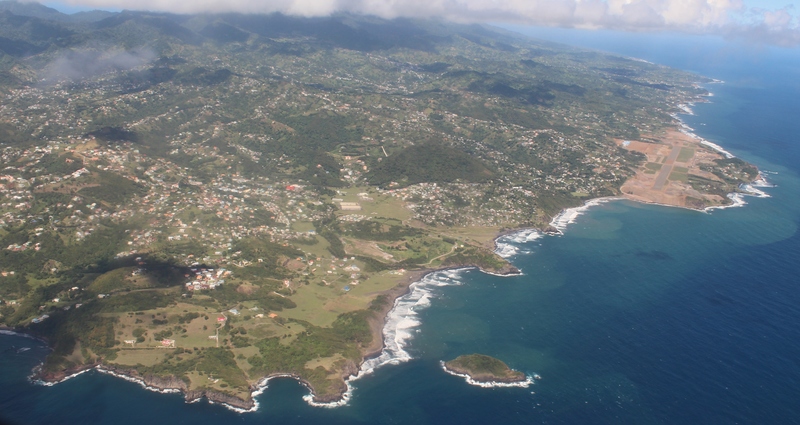 Aerial view of the south-east corner of St Vincent, looking north along the windward coast. Inland, the topography is rugged, and often heavily vegetated, and rises towards the active volcano, the Soufriere of Sty Vincent, which is hidden under cloud at the top left of the picture. The new airport runway, at Argyle, runs across the brown strip of land forming the eastern-most headland. St Vincent is a volcanic island, and part of the arcuate chain of the Lesser Antilles volcanic arc. The active volcano on St Vincent is called the Soufrière; a name that describes its sulfurous nature, and shared by other volcanoes in the Antilles including the Soufrière Hills volcano (Montserrat), and the Soufrière of Guadeloupe. While the geological record of past eruptions of St Vincent stretches back for hundreds of thousands of years, the historical record of known eruptions is short, but dramatic. The first known explosive eruption of St Vincent was in March 1718. By all accounts this was a major eruption, preceded by an extended period of felt earthquakes. While there are no known first-hand descriptions of this eruption, a writer, thought to be Daniel Defoe, published an “An account of the Island of St. Vincent in the West Indies, and of its entire destruction on the 26th March last” in the Weekly Journal or Saturday’s Post of July 5th, 1718 (also known as Mist’s Journal), based on correspondence from ships that had been in the vicinity. This describes a short, but violent explosive eruption “They saw in the night that terrible flash of fire, and .. heard innumerable clashes of thunder”, and the fallout of ash far downwind “In the afternoon they were surpriz’d with the falling of something upon them as thick as smoke but fine as dust, and yet solid as sand ; some ships had it nine inches, others a foot thick, upon their decks; the Island of Martenico [Martinique] is covered with it at about 7 to 9 inches thick; at Barbadoes it is frightful, even to St. Christophers it exceeded four inches.” Defoe’s account became well known when it was later included in a collection of his works (Romances and Narratives, Volume 15, edited by George Aitken and published in 1895/6). 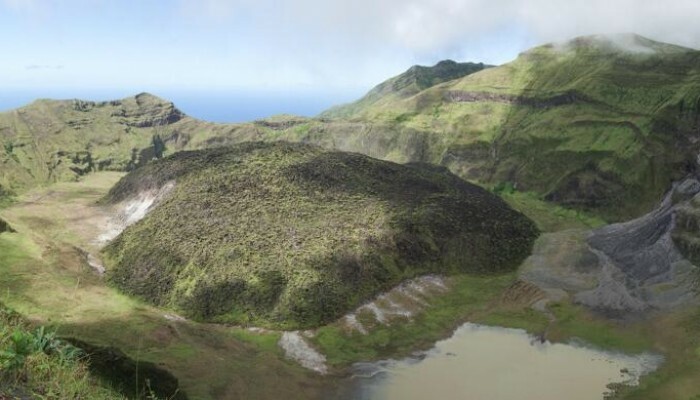 The first detailed account of the crater of the Soufrière dates to 1784 – when Alexander Anderson, then curator of the Botanic Gardens of St Vincent, wrote an account of “The mountain of Morne Garou in the island of St Vincent and the volcano in its summit“. This letter was published in the Philosophical Transactions of the Royal Society, along with a fabulous plate showing the crater, partly filled with water and with a steaming dome (of what we now know to be lava) at its centre. In many respects, this view is remarkably similar to the state of the crater at the present day. The next major eruption of St Vincent occurred in 1812, in an event which was captured dramatically both in written reports, and in a painting by JMW Turner (The eruption of the Souffrier Mountains, in the Island of St Vincent, at midnight on the 30th of April, 1812, from a sketch taken at the time by Hugh P. Keane). The observer who provided the sketch, Hugh Perry Keane, was a barrister and plantation owner; his diary of the eruption survives in an archive in Virginia, but not the sketch. ‘Description of the eruption of the Souffrier Mountain on Thursday night the 30th April 1812, in the island of Saint Vincent’. Extract from the Report from the Committee on Petition of Persons Interested in Estates in the Island of Saint Vincent, Parliamentary Papers of the House of Commons, Printed by Command, 7 May 1813, pp 182-193. The same description was published in The Times newspaper of 30 June 1812. British Parliamentary Papers from 1813 contain a ‘Description of the eruption of the Souffrier Mountain on Thursday night the 30th April 1812, in the island of Saint Vincent’ which introduces the volcano and describes the precursory activity. This account had previously been published in The Times newspaper, and appears to be based on written testimonies from residents on the island that had been sent to the newspaper. Nearly a century went by before the next eruption; a hugely destructive event that began in earnest on 7th May 19o2, just a day before the destruction of St Pierre on the nearby island of Martinique, following the eruption of Mont Pelée. 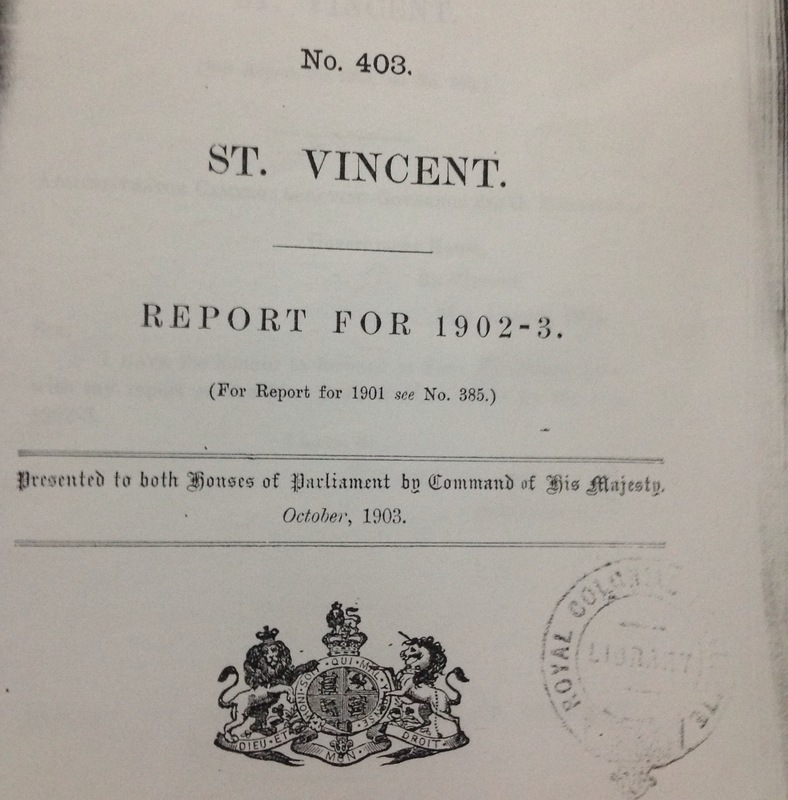 The 1902 – 1903 eruptions of St Vincent resulted in a great loss of life (at least 1500), and severe economic impacts, all of which were widely documented in articles and reports at the time. As a result, we have a fantastic archive of primary observations, data and material to work with as we set out to investigate, retrospectively, the nature and consequences of the 1902 eruption – a type of event which has occurred three times in the past 300 years. Documentary evidence from this eruption includes the correspondence, reports and photographs from the wonderfully named Tempest Anderson, an opthalmologist, photographer and early volcano-tourist. Anderson was rapidly commissioned to make a field visit to the island, which he published in early 1903. As this letter to the Royal Society attests he was a stickler for detail, and his accounts and photographic records from the time make for astonishing reading. Letter from Tempest Anderson to the Assistant Secretary, Royal Society, from the Royal Society Archives. Meanwhile, the details of the eruption and its effects are exhaustively recorded in Colonial Reports and Parliamentary Papers from the time. Colonial Reports – Annual – for 1902-1903. St Vincent. ‘All minor events are eclipsed by the appalling eruption of the Soufrière volcano, which on 7th May awoke from its 90 years’ slumber to again hurl death and devastation over nearly one-third of the hapless Island of St Vincent‘, Edward J Cameron, Administrator. After 1903, Soufrière St Vincent returned to a state of quiescence which wasn’t disturbed until 1971, when a remarkably quiet eruption built a new lava dome within the flooded crater of the volcano. This new activity, and the subsequent unrest on the nearby island of Guadeloupe in 1976, helped to stimulate the expansion of networks of instruments, including seismometers and tiltmeters, to monitor the volcano. This investment paid off quickly, with the rapid onset of new activity in 1979. The 1979 eruptions began with only a very short period of unrest, starting with a strong local earthquake on April 12. Eruptive activity began with a series of short-lived but violent explosions and that lofted a series of ash plumes, high into the sky on April 13, 1979; Good Friday. This heralded two weeks of vigorous activity that peaked with an 18 km high plume on April 17, and ended, with the cessation of measurable seismicity on April 29. After this, the eruption switched to the quiet extrusion of lava, slowly forming the dome that still sits in the crater today. The 1979 eruption caused much disruption, with 20,000 people evacuated to shelters, but no direct loss of life. 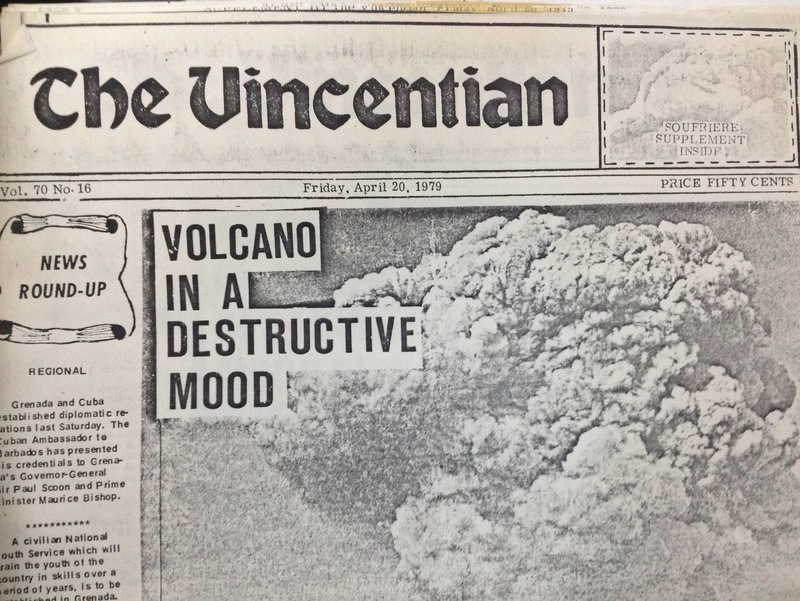 The Vincentian newspaper, Friday 20 April 1979 – one week into the eruption. One of the goals of the workshop on St Vincent was to find out from the residents of St Vincent and neighbouring islands about the current awareness of volcanic risk, and risk communication. 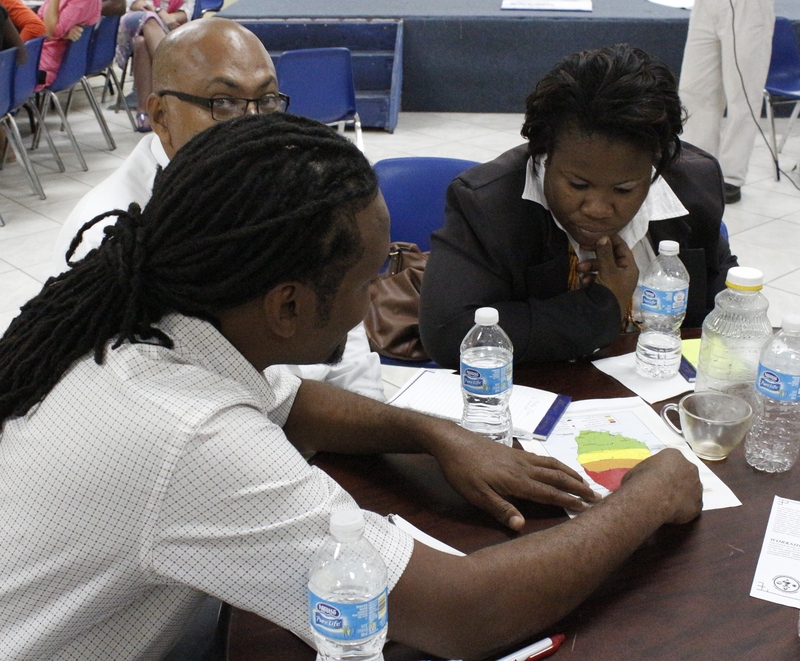 Participants included representatives of emergency management organisations both from St Vincent and the Caribbean region, as well as residents of St Vincent from all walks of life, including those with direct experience of the eruptions of the 1970’s, and people currently charged with reponsibilities across the spectrum of disaster management and response, both in the public and private sectors. This was a tremendous experience, and the STREVA team arel now working hard to analyse the results, develop new ideas and share understanding of how best to improve preparedness for future volcanic unrest and the response to future volcanic emergencies. Workshop discussions of the likely response to a future volcanic scenario, focussing on the current volcanic hazard map of St Vincent. I wish to thank archivists and librarians at the Royal Society, the Geological Society of London, the National Archives of St Vincent and the Grenadines, the Barbados Museum and Historical Society, the British Library, Cambridge University Library and the Bodleian Libraries, University of Oxford, for access to archives and literature sources. Many thanks also to Paul Cole for the wonderful photo of the crater, to Willy Aspinall for the trails to Daniel Defoe and JMW Turner, and to Anna Hicks and Jenni Barclay for all of their work in putting the workshop together. The STREVA project is funded by UK Research Councils NERC and ESRC under the Improving Resilience to Natural Hazards programme. The workshop on St Vincent was supported by the National Emergency Management Organisation (NEMO) of St Vincent and the Grenadines, the Caribbean Disaster Emergency Management Agency (CDEMA), and the University of the West Indies Seismic Research Centre and we acknowledge the support of many people and organisations both in St Vincent and across the Caribbean for their contributions to the discussions and for helping to make this event such a success. 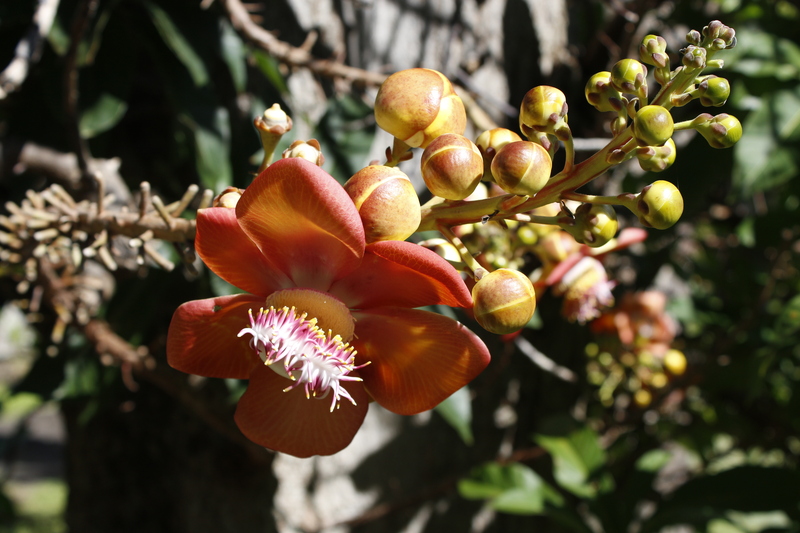 Post on the Botanic Gardens of St Vincent and the Grenadines. Report on the STREVA workshop on Montserrat, October 2012: Montserrat, Open for Business. Field Photo, Soufrière Hills Volcano, Montserrat, 1998. 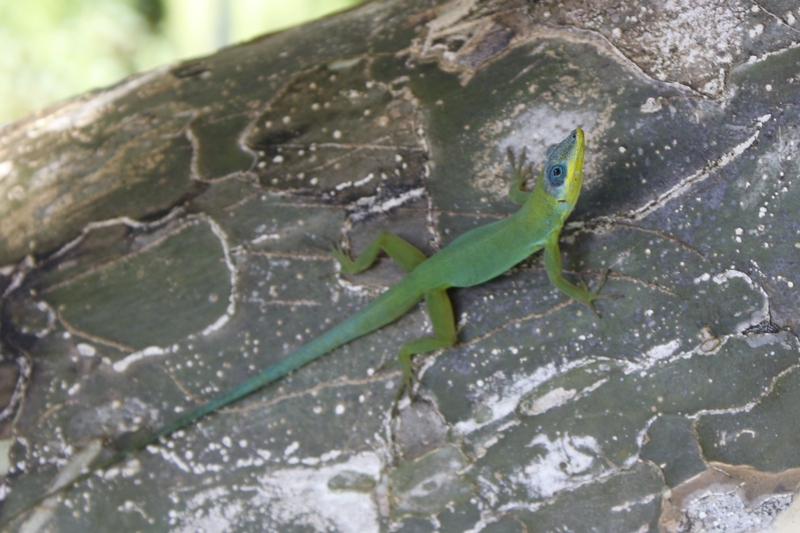 Post from Charly Stamper – Soufrière Saint Vincent on the blog Between a Rock and a Hard Place. 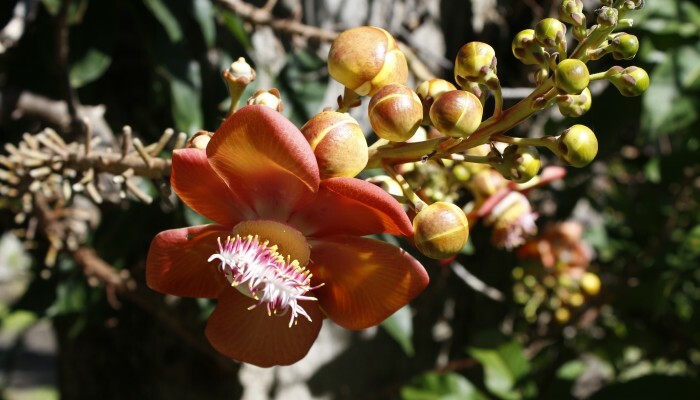 The oldest Botanical Gardens in the western hemisphere lie on the outskirts of Kingstown, St Vincent, in the Windward isles of the West Indies – and what a gem they are. As the ironwork above the entrance declares, the gardens were founded in 1765. The original ambition of Robert Melville, the then Governor in Chief of the Windward Isles, was to establish a horticultural research station for ‘the cultivation and improvement of many plants now growing wild and the importation of others from similar climates” which would ” be of great utility to the public and vastly improve the resources of the island”. 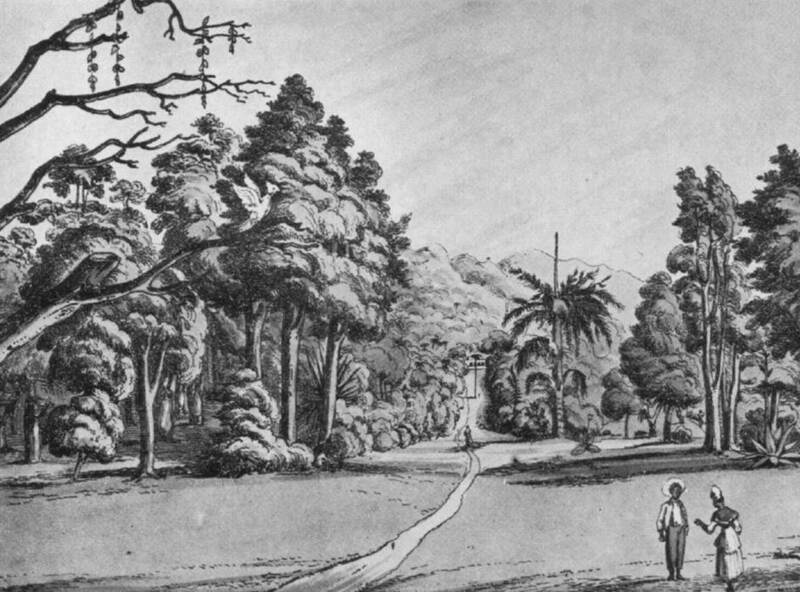 The early years of the Botanical Garden saw the rapid establishment of cinnamon, nutmeg and mango trees, among others, leading to awards from the newly formed Royal Society for the encouragement of Arts, Manufactures and Commerce, which was offering a number of medals and monetary prizes for the promotion of agriculture in the then colonies of the British Empire. 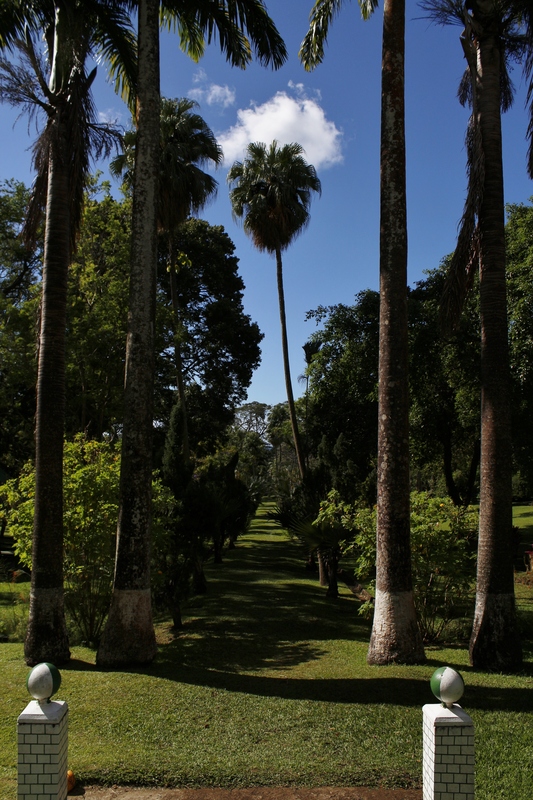 The Botanic Gardens flourished under the direction of its first two superintendents, George Young (also Medical Officer for St Vincent) and later Alexander Anderson, a surgeon and botanist. 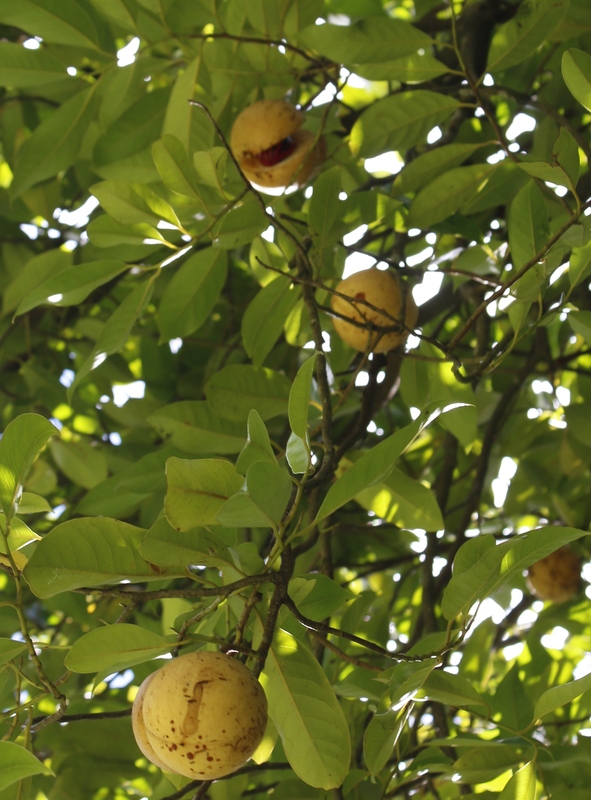 Anderson was, among other things, responsible for the establishment of breadfruit on St Vincent (delivered by Captain William Bligh, formerly of HMS Bounty, and later HMS Providence – both ships designed for botanical missions). He also wrote an early account of a visit to the volcanic crater of Morne Garou (now called the Soufrière of St Vincent). A view of a part of the Central Walk of the Botanic Gardens at the present day. After 1819, the gardens fell into decline and were not reinstated until 1890. In the latter years of the nineteenth century, the gardens were re-established under the curatorship of Henry Powell, to include a botanical station for experimenting on the development of new crops and new agricultural techniques, with experimental plots distributed around the island of St Vincent. By this stage, the production of two economically-significant crops of sugar and arrowroot were already in decline, and considerable efforts were made to develop the potential for Sea Island cotton growth on the islands. 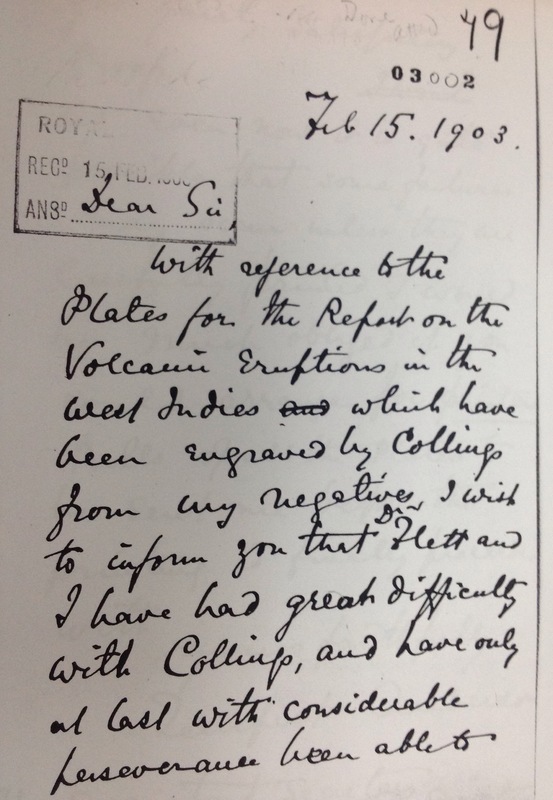 Scientific results from these experiments were reported in great detail annually, so there is a wonderful archive record of the subsequent impact of the devastating eruptions of the Soufrière of St Vincent in 1902-1903 on agriculture across St Vincent. The experiments on cotton growth also meant that the agriculturalists of the day were well prepared to diversify into this new crop following the eruption. 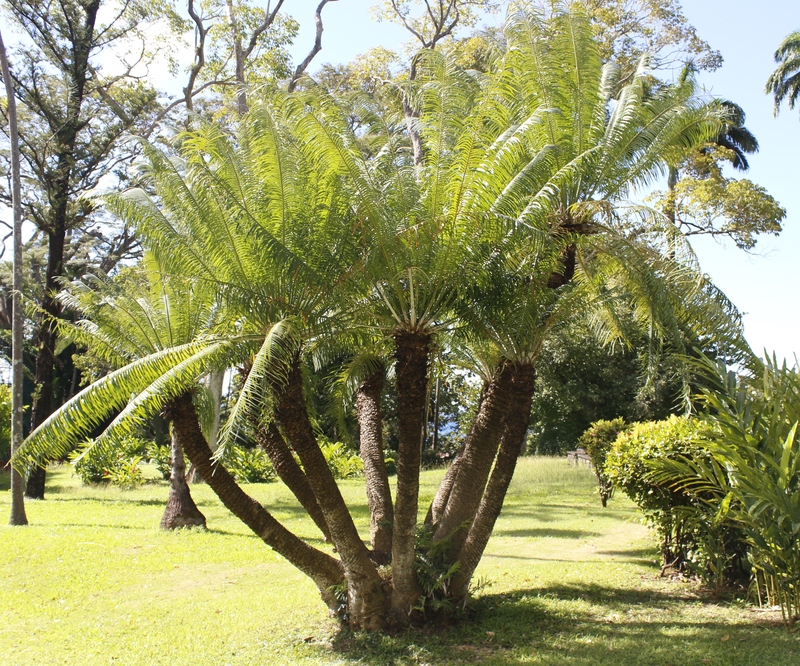 The Botanic Gardens remain under the jurisdiction of the Ministry of Agriculture of St Vincent and the Grenadines, and the legacy of its (nearly) 250 year history can be appreciated in the diversity of the mature trees and plants that can be enjoyed every day by visitors to the gardens. Anderson, J. (1785). An account of Morne Garou, a mountain in the island of St Vincent with a description of the volcano on its summit in a letter from James Anderson (surgeon) to Mr. Forsyth His Majesty’s Gardener at Kensington, communicated by the Right Honourable Sir George Yonge, Bart. F. R. S. Philosophical Transactions of the Royal Society 1785, 75, doi: 10.1098/rstl.1785.0003. As noted in the Dictionary of National Biography, the author’s name was clearly incorrect in the published letter. Howard, R.A. (1954) A history of the Botanic Garden of St Vincent, British West Indies. Geographical Review 44, 381-393. 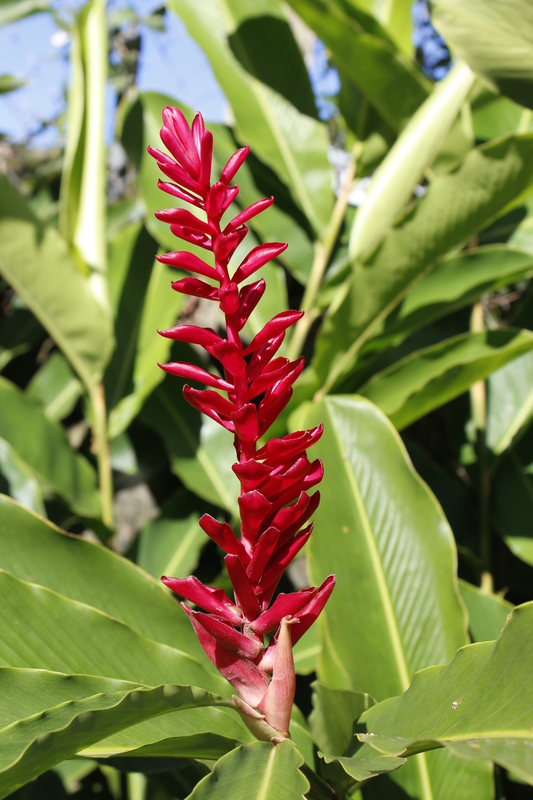 I visited the Botanic Gardens during a STREVA project workshop on St Vincent; more about this in a later post. Many thanks to Errol for his masterful guidance and tour. The spectacular front cover of the Geological Society of London Special Publication 380 – with many thanks to Elspeth Robertson and ESA for this SPOT5 image of Longonot volcano, Kenya. A major goal of volcanological science is understand the processes that underlie volcanic activity, and to use this understanding to help to reduce volcanic risk. 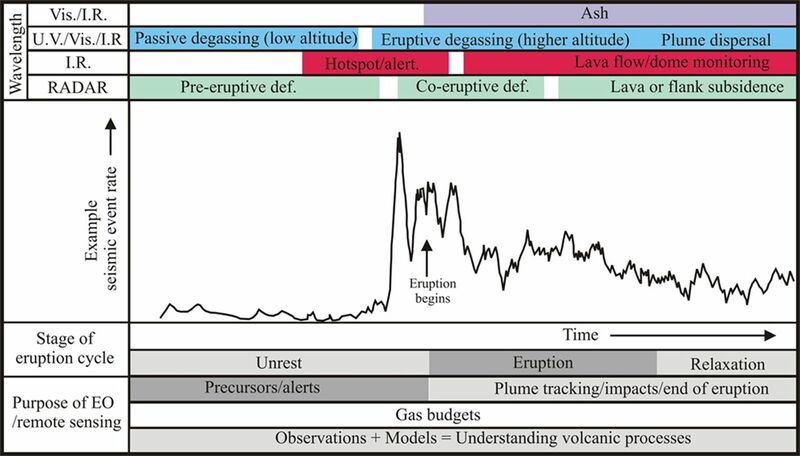 Advances in instruments and techniques mean that scientists can now measure many different aspects of the behaviour of restless or active volcanoes, including seismicity (to detect magma movement at depth, for example); deformation (often reflecting pressure changes at depth); and emissions of heat and gas. With the exception of seismicity, which requires sensitive instruments placed close to the volcano, many of these measurements can now be made remotely using instruments on board satellites or aircraft. Remote-sensing techniques have transformed our capacity to detect, monitor and measure volcanic activity worldwide. In the past 35 years, applications have moved from the first satellite remote-sensing observations of the rise and spread of a volcanic plume and volcanic gases from an explosive volcanic eruption (the April 1979 eruption of the Soufriere of St Vincent in the Caribbean); to the current situation where constellations of satellites are used to provide routine monitoring of volcanic gas emissions, volcanic hotspots and volcano deformation. As well as dramatically improving our ability to monitor the progress of volcanic eruptions, these techniques also help us to understand better how volcanoes work by providing long-term data on what happens at volcanoes when they are not erupting; and by making it possible to compare the behaviour of different volcanoes in ways that are simply not possible from the ground, or with ground-based observations. In a new Geological Society of London Special Publication, we have brought together a selection of papers that give a broad perspective of the current state of the art in the remote sensing of volcanoes and volcanic processes. 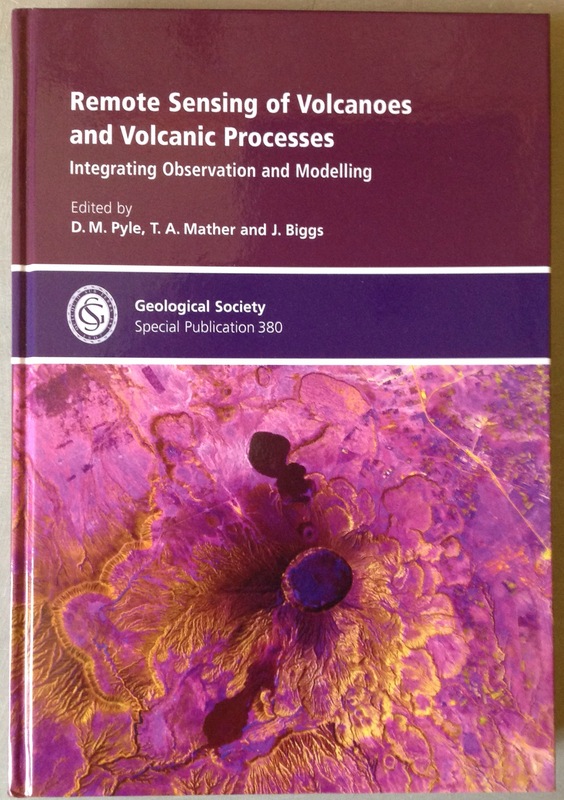 The 14 papers in the volume focus on the observation, modelling and interpretation of satellite-remote sensing of volcanoes: from surface deformation, to thermal anomalies, gas fluxes and eruptive plumes. Many of the papers take a broad perspective, reviewing current techniques and applications, or demonstrating the potential to investigate volcano behaviour and volcanic activity at regional to global scales. Papers in the volume also show the ways in which people are now trying to go from these observations to a deeper understanding of underlying processes, by integrating observations with theoretical models and computer simulations of volcano behaviour; and then to use these insights to advance the potential for eruption forecasting. We hope that this Special Publication will find a wide and appreciative audience out there! An illustration of some of the applications of remote-sensing techniques to a volcano through a hypothetical eruption cycle, across wavelengths ranging from the Infrared (I.R. ), through the Visible (Vis.) and Ultraviolet (U.V. ), to radar (ca. 2.5 – 30 cm in volcanic applications). Earth Observation (EO) techniques now allow the detection and analysis of a spectrum of different aspects of volcano behaviour at both non-erupting and erupting volcanoes. From the introduction to the Geological Society Special Publication 380 (Pyle et al., 2013). The seismic event rate trace is schematic, but based on observations at Mt St Helens in March – May 1980. Editing a volume of this scale requires a lot of support from a lot of people. On behalf of the editors (Tamsin Mather, Juliet Biggs and myself), we would like to thank the authors of all of the contributions for their hard work and for entrusting their manuscripts with us; we would like to thank the very many reviewers who selflessly gave up their time to provide the feedback and constructive criticism of the papers that is the key part of the peer-review process; and we would also like to thank the staff of the Geological Society’s Publishing House, and in particular Angharad Hills, Tamzin Anderson and Hannah Sime, who shepherded this v0lume from start to finish, and who have turned our initial idea into such a wonderful physical volume. Finally, and on behalf of all of the authors, we would like to acknowledge the many individuals, institutions and agencies who have provided the facilities, funding, imagery and datasets which have underpinned all of this work. Pyle DM, Mather TA, Biggs J (eds) 2013. 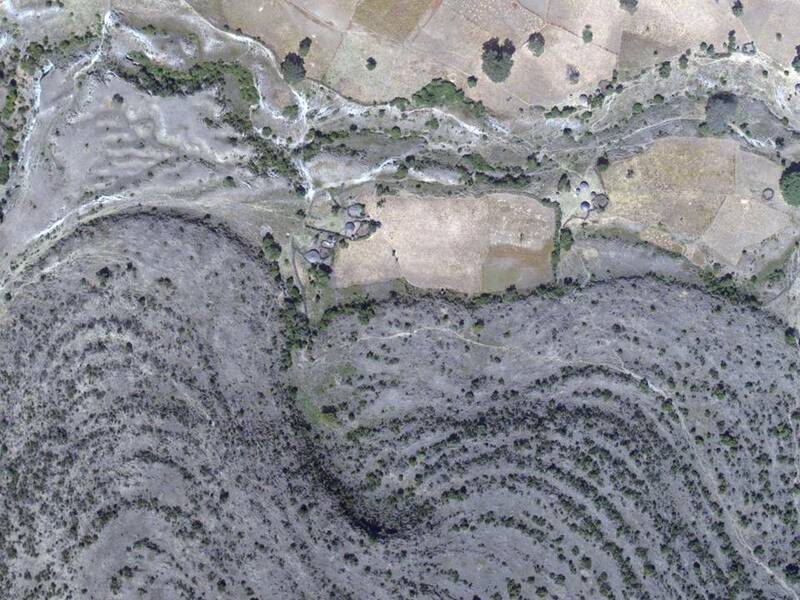 Remote sensing of Volcanoes and Volcanic Processes: Integrating Observation and Modelling. Geological Society, London, Special Publications, 380. ISBN 978-1-86239-362-2. The volume is available to subscribers through the Geological Society’s Lyell Collection, and can be purchased via the Geological Society’s online Bookshop. van Manen, S et al. – Forecasting large explosions at Bezymianny volcano using thermal satellite data.